What the hell is an 'audio description'?! What, you mean words? How does that help the blind? Or is it a narrator, who after Daredevil says "Stop right there!" comes in and says "Daredevil just said 'Stop right there!'" I'm sorry, but I'm not convinced every medium can be translated to people who can't sense that medium. If its like the Star wars BBC radio thing that would be pretty badass. Audio discription is basically like audio book but they don't interfere with the dialogue part of the show. Eg. Daredevel "Stop run there". The he chase the thief (what happened on screen). Audio narrator "Daredevil proceed to chase the thief in the heavy rain as he climb up the soaking ladder". OT- Good for them seeing how was the blind community give them their blessing when Stand Lee was going to create a blind superhero but he was nevous as he didn't wanted to offend them. I'd like you to look up "radio dramas" especially "The Shadow". Listen to one of them. Yeah theres a lot of quality Radio dramas out there. Good on Netflix. Pretty embarrassing that they overlooked (no pun intended) this in the first place, but good on them for stepping up and including them so quickly. This post can easily be summed up with the statement, "I lack the imagination to see how it would work, therefore it probably can't be done." Never mind that shows with described video have been around for years now. This is pretty damn cool. I don't know if this is common practice, but if it isn't I guess it's awesome that a show about a blind superhero might be making an actual difference in the way TV shows deal with accessibility. Plus, if it's well done it might even be cool to listen to as a radio drama in its own right. How can this be so confusing to you, its a description using audio, have you ever heard of a radio? thats how they used to tell stories before TV's, books work the same way except its written not audio. I think Matt Murdock can watch tv. He isnt exactly blind in the normal sense. He is like that guy in Star Trek Next Generation, he has a disability (blind) yet sees better than normal people. lol. :-) Joking aside, this is really great for the blind fans. 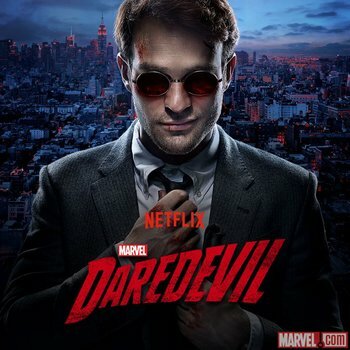 Daredevil the series has been great, very enjoyable and cant wait for series 2. Actually it made me excited for the other Marvel tv shows. Also the guy that played Wilson was amazing, was such a great villain with lots of depth and character. Especially since getting them ready in less than a week means they probably started on them as soon as they heard the first complaint, and they probably paid through the nose to make it happen so quickly. I can understand people failing to take into account the disabilities of others, no one is perfect. What matters to me is what people do with those failures, and Netflix stepped up. Good on them. Daredevil's power have waxed and waned over the years, but he can't watch tv. Flat surfaces with writing or pictures appear blank to him. You're right he's not classically blind. He can see 360degrees with his "radar sense". He can also perform feats like feeling the ink on paper to read. Um... but how does a blind person even, ya know, even navigate the Netflix menu? With the help of a friend or family member who is not blind. They are blind not lepers, forever cursed to live alone. Also computers have accessibility programs that help blind people use them. I assume through the use of a Braille keyboard and text to speech software. Good for Netflix. I like a good audio drama I met check this out myself after I watch it for the first time. This is pretty great. That said how common is it for shows to have this option? I've never heard of it tbh. This is one of those things that wouldn't have happened if it wasn't for the newsworthiness. Which i guess is kind of sad; series like this had been going without assistance for the blind for years, but it took the show ABOUT a blind man to make people realize it. "Though it was a huge missed opportunity to not launch Daredevil with audio descriptions, Netflix has stepped up to promptly resolve this ironic issue. " It was no doubt calculated to generate *this* extra publicity after the series had launched. A screen reader most probably. I have worked with a software developer that was blind. I listened to his screen reader a few times and I was utterly amazed at how he could understand anything it read to him considering the ludicrous speed it was reading at. To me it was just a blur of words. To him it was a vital tool to get work done, and he did. I was really impressed. A good deed committed for selfish reasons is still a good deed. Be cynical if you wish, but at least have the presence of mind to realize that your cynicism is irrelevant in this particular instance. If I was blind, this would actually be pretty sweet for me. Since it's talking about action descriptions, I suspect it's things like "Hallway shot, Daredevil slowly approaches a door, then braces to kick it in." Then they actually hear all the crashing noise and punches, followed by stuff like "Daredevil and several thugs fight violently in a hallway" So they can at least have context to the audio they are hearing that isn't dialogue. And to also acknowledge that the cynicism is pure speculation. No evidence suggests it was done intentionally. But, maybe this is just a sign of my ignorance but the idea of letting the blind navigate a netflix menu sounds like an engineering feat that should be as well known and respected as us putting robot on mars. Mind = Blown.